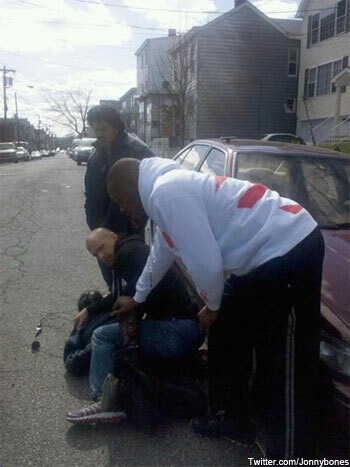 With the opportunity to don UFC gold at the tender age of 23 only hours away, Jon Jones and his coaches were out and about in New Jersey on Saturday when a evildoer decided to break a window of a woman’s car to steal a GPS system. That’s when Jones, Mike Winklejohn and Greg Jackson dropped everything to chase the thief down. then I threw my phone down and went with my coaches. Before you know it, we’re sprinting up a steep hill chasing after him. Sounds pretty unbelievable, right? Well, Jones’ driver took a picture of Jackson, Winklejohn and the budding superstar subduing the criminal as proof. UFC 128 takes place tonight inside the Prudential Center in Newark, New Jersey. Jones challenges light heavyweight champ Mauricio “Shogun” Rua for his crown in the night’s main event.